Haq's Musings: Will Pakistan Rejoin Emerging Markets Index? Over the next 6 months $2-2.5 billion of new float is expected to come on stream from Pakistan through government's privatization of assets which should take its MSCI frontier market weightage higher to 9-9.5% with its subsequent effects on passive flows, according to a report in Baron's. Market classifications of securities from various countries into developed, emerging and frontier indices are made by Morgan Stanley based on a minimum market capitalization and size of free float. 1. First, the companies in the DM Equity Universe are sorted in descending order of full market capitalization and the cumulative coverage of the free float‐adjusted market capitalization of the DM Equity Universe is calculated at each company. Each company’s free float‐adjusted market capitalization is represented by the aggregation of the free float‐adjusted market capitalization of the securities of that company in the Equity Universe. 2. Second, when the cumulative free float‐adjusted market capitalization coverage of 99% of the sorted Equity Universe is achieved, the full market capitalization of the company at that point defines the Equity Universe Minimum Size Requirement. 3. The rank of this company by descending order of full market capitalization within the DM Equity Universe is noted, and will be used in determining the Equity Universe Minimum Size Requirement at the next rebalance. As of April 19, 2011, the Equity Universe Minimum Size Requirement is USD 140 million. Companies with full market capitalizations below this level are not included in any Market Investable Equity Universe. The Equity Universe Minimum Size Requirement is reviewed and, if necessary revised, at Semi‐Annual Index Reviews. "Things that were held up due to the protests – IPOs, privatizations, reforms, the $800 million share sell of our largest oil and gas company OGDC – have now resumed. When the OGDC deal is executed, I think that will give a very clear signal to the international business community that the protests may still be going on, but investment and business already are operating as usual. 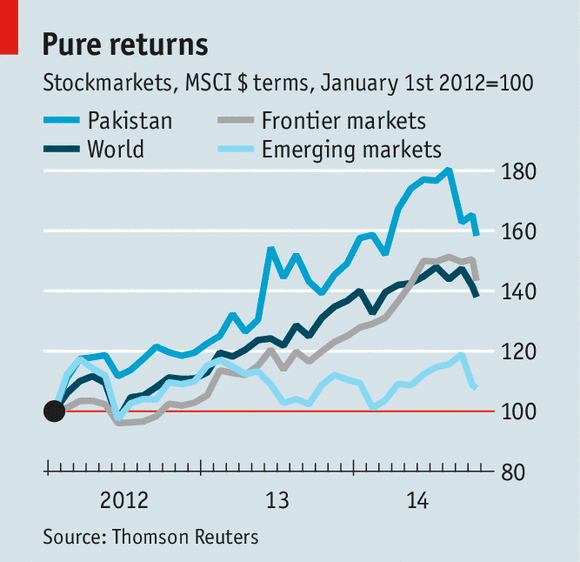 Pakistan is an unexplored market by most outside investors that is not marketed properly. Compared to peers, the market is very cheap. Pakistan’s markets trades at a price/earning multiple of 7.5 times; a 30% to 40% discount to Sri Lanka, Bangladesh, Nigeria and Vietnam. For me, from an investor’s point of view, the next 24 months look very positive for the equity markets." Increase in Pakistani shares weight in Frontiers Index and expected re-entry in Emerging Markets Index are both welcome developments for Pakistan's economy. As a result of these developments, Pakistan should expect new capital inflows which would strengthen Pakistan's balance of payments position and spur the nation's overall economic growth. "There's been a reversal in the sentiment towards emerging markets over the last two weeks. Everyone loved to hate them, and now, all of sudden everyone is increasing their positions," said Rajeev DeMello, head of Asia fixed income at Schroders Investment Management in Singapore, which has $435.4 billion of assets under management. ^^RH: " Some analysts believe that Pakistan could re-gain the Emerging Market classification (which includes BRIC countries) in a couple of years"
What is the basis for this belief? Can you tell us what the TRIGGERING event or parameter for this switch might be? 1) Pakistan will re-gain Emerging Markets classification ONCE its GDP growth crosses 5% per annum. 2) Pakistan will re-gain Emerging Markets classification ONCE its savings-rate crosses 10% of GDP. Something else in the form of (1),(2),(3). HW: "What is the basis for this belief? Can you tell us what the TRIGGERING event or parameter for this switch might be?" Read the post again to see if you can identify what is triggering a jump in market cap and float size for several securities traded on Karachi stock exchange. It's a test of your reading comprehension. Pakistan launched a trade dispute at the World Trade Organization on Wednesday to challenge the European Union's punitive duties on Pakistani exports of polyethylene terephthalate (PET), the WTO said in a statement. Pakistan says the EU has broken WTO rules in the way that it imposed anti-subsidy duties on PET, which is used in synthetic fibres, plastic bottles and food containers. Under WTO rules, the EU has 60 days to try to settle the dispute in direct talks, after which Pakistan could escalate the issue by asking the WTO to set up a panel to adjudicate. Pakistan's exports of PET were worth just over $200 million last year, according to data from the International Trade Center, a U.N.-WTO joint venture. Although its exports have grown, sales to the EU have dwindled in the past few years. The EU accounted for over 80 percent of Pakistan's foreign sales of PET a decade ago, but less than 10 percent of Pakistani PET exports went to the EU in 2013, a tiny slice of the EU's $4.3 billion imports of the material. The dispute is the first that Pakistan has initiated in almost a decade and its first against the EU. It previously launched three disputes - two against the United States and one against Egypt, which was settled in 2006. Pakistan on Saturday postponed indefinitely the planned sale of up to 10% of its majority stake in the country’s largest oil and gas business, officials said, in a blow to the government’s ambitious privatization plans. Pakistani officials cited falling global oil prices for their pulling the offering on the London and Karachi stock exchanges of shares in Oil and Gas Development Co. Ltd. But there was also a poor response to the offer, analysts said, saying there also appears to be in general a wariness abroad toward investing in Pakistan. The sale of 10% of the government’s stock in the company had been expected to raise at least $800 million, and it was expected to be the biggest divestment by Prime Minister Nawaz Sharif ’s government since it came into power in June last year. Employees own 10% of the company’s shares and the remainder is listed and traded on exchanges. At the close of trading on Friday, however, bids had come in for just 52% of the Oil and Gas Development’s shares on sale, Privatization Minister Mohammad Zubair told The Wall Street Journal. Some investors in London, who asked not to be identified, said they remained concerned about political and economic risk in Pakistan and would be interested only if there were steep discounts in price available. Global oil prices have declined for months, with that of the world’s benchmark crude oil, North Sea Brent, down 28% since June. Mr. Zubair also mentioned recent political unrest as contributing to negative investor sentiment toward Pakistan. The Pakistani energy company’s stock offering was twice earlier delayed by political protests in Islamabad against the government and by a legal challenge to the divestment. Officials said the sale would have been a major boost to Pakistan’s fragile economy, which was hit by political unrest in August, when two opposition leaders, sportsman-turned-politician Imran Khan and Muslim cleric Tahir ul Qadri, marched on Islamabad with thousands of supporters for a sit-in, alleging election fraud and demanding Prime Minister Sharif’s resignation. Karachi Stock Exchange’s (KSE) benchmark 100-share index increased 369 points to reach 31,299.97 points, Express News reported on Monday. Since the start of trading today, shares of 200 companies increased while shares of 44 companies declined. The previous peak of 30,593 points came on November 5 which analysts credited to falling inflation and commodity prices as well as to easing of political tensions. Official data has showed that inflation had plunged to a 17-month low, raising investors’ hopes that the central bank might slash the basic interest rate in its next review. The country’s long-moribund economy has shown some glimmers of revival under Prime Minister Nawaz Sharif’s government. Ratings agency Moody’s upgraded the country’s outlook to ‘stable’ from ‘negative’ in July, citing its improving external liquidity position and commitment to reforms. With its shiny new articulated buses, freshly dug underpasses and dedicated flyovers, Islamabad’s new public transport system is supposed to be a symbol of a government that gets big things done. But as a December deadline approaches before thousands of civil servants supposedly start taking the 15-mile Metro Bus journey for their commute into the heart of Pakistan’s capital, the final section of the route along the city’s main avenue is a mess of giant holes and ripped up concrete. Frantic construction work on the £265m scheme ground to a halt in August when thousands of anti-government protesters, led by opposition politician Imran Khan and a cleric called Tahir-ul-Qadri, flooded into the city. It is not just an important project that has been held up. The protesters also succeeded in paralysing prime minister Nawaz Sharif’s government. The industrialist won a landslide victory in 2013 with promises of reviving a dying economy, forcing a meddling army to finally accept the authority of elected civilians, and making peace with India. More than 18 months later and every part of Sharif’s ambitious agenda is seriously off track. India has responded to Sharif’s peace overtures with an unprecedented upsurge in cross-border firing. At home the government has been badly bruised by ferocious disagreements with the military, which earlier in the year succeeded in forcing the closure of one of country’s most popular private news channels, against the government’s will. And international investors have been seriously put off by the sight of thousands of protesters overwhelming the government quarter of the capital and smashing their way into the grounds of parliament in late August. “Before the protests we had a brilliant story to tell about Pakistan,” said Mohammad Zubair Umar, chairman of the privatisation commission. Last year, 2013, had been a turning point for Pakistan, he said, pointing out that it was the first time a government had survived a full five-year term without being ousted in an army-backed coup. It also saw the first successful transfer of power to another elected government. “We told investors that we now had the kind of political stability Pakistan never witnessed in its first 60 years,” Umar said. But many observers feared Pakistan might be reverting to type when Khan descended on Islamabad to protest against the 2013 election, which he claims was stolen from him – something independent election observers are highly sceptical about. Multimillion-dollar transactions to offload shares in the country’s Oil and Gas Development Company had to be postponed – foreign lawyers and financial advisers stayed clear of the country, let alone Umar’s office, which overlooks the parade ground Khan has taken over for his sit-in. But despite the damage done, Sharif is determined to regain the initiative. On 4 November he tried to inject some energy into the government’s effort to eradicate polio, which Pakistan has struggled to bring under control. And on Friday he jetted off for a visit to Beijing following the deep embarrassment caused by the decision of China’s president, Xi Jinping, to cancel a trip to Islamabad in the wake of the protests. Sharif has told his cabinet to press on with implementing unpopular decisions, including weaning the public off unaffordable electricity subsidies as part of an effort to end rolling power blackouts that have badly stunted economic growth. “His political room to manoeuvre has narrowed and everything that was hard, on the economic reform programme, has got harder,” said one diplomat. KARACHI: MSCI, a leading provider of investment decision support tools worldwide, has announced the results of semi-annual index review for MSCI equity indices. Analysts noted that in the seven months of this year, Pakistan attracted foreign portfolio investment (FPI) inflow of $427 million, which accounting for 20 per cent of the cumulative net inflow of $2.2 billion seen by the frontier markets (FM) during the period. Although there were no additions or deletions to MSCI FM 100 index during the semi-index review, the MSCI FM small cap index saw the highest additions of three companies from Pakistan. Currently, the country has 15 companies in MSCI FM index, i.e. OGDCL, MCB, FFC, UBL, POL, ENGRO, NBP, HBL, PPL, PTC, FATIMA, PAKT, KEL, LUCK and PSO. The small cap index would now include Indus Motors; Murree Brewery and Lafarge Pakistan Cement from Nov 26, 2014. As a result, Pakistan’s representation in the MSCI FM small cap index would be 23 companies and 12 companies in the main MSCI FM 100 index. Pakistani stocks today set a new record with benchmark KSE-100 scaling the 32,000-point level for the first time in its history as investors cheered the recent interest rate cut by the country's banking regulator......Analysts say foreign fund managers showed exceptional interest in the market and it is expected that the bullish trend may continue at the bourse in the coming days. KARACHI: The inflows of foreign direct investment (FDI) in Pakistan surged by a significant 47.1 percent to $423.8 million in the first four months of the current 2014/15 fiscal year, the central bank said on Monday. The FDI over tripled during the month October to $254.3 million against $57 million in the same period last year due to improvement in political environment. However, portfolio investment in the month was recorded at negative $2.2 million as against $33.5 million in September last year. China contributed $167.3 million to the total inflows in the month. Ahsan Mehanti at Arif Habib Corporation said the inflows that were on halt in the previous months due to political uncertainty materialised in October. Schehzad at Lakson Investments said there were expansions, particularly in the telecom sector after the award of 3G licence, which invited inflows. “There has not been any significant shift in the mindset of the foreign investors or installation of any mega project in the country. There has been small-scale expansion in the working capital in oil & gas and power sectors, which improved the numbers,” Schehzad added. Overall, foreign private investment increased by 66 percent to $600.1 million in the period under review, primarily because of huge surge in the FDI flows during October. Portfolio investment in the four-month (July-October) period was recorded at $176.3 million as compared to $72.2 million in the same period last year. Schehzad said the stock market is performing and returns are impressive, which is attracting investment. Moreover, the increase of Pakistan’s market weightage to 7.02 percent in the MSCI FM index resulted in heavy portfolio investment. The United States remained the largest contributor in the FDI with an investment of $100.1 million during the four-month period; followed by Switzerland with $93.9 million and Hong Kong with $59 million. As far as the portfolio investment is concerned, the US injected $162.2 million in the country’s equity market; followed by Switzerland with $99 million, while Norway pulled out $71.1 million from the country’s bourse. Frontier markets are emerging markets’ smaller, more fragile siblings, but these tiny economies–ranging from Africa to the Middle East and on to the fringes of Asia–usually offer the prospect of more growth. We reached out to two frontier fund managers to ask where they are picking stocks. Vietnam and Pakistan are two common favorites. A third attractive country knocking on the emerging market category’s door is Saudi Arabia. Both emerging and frontier countries offer cheaper valuations than developed markets. But frontier markets, based on Standard & Poor’s Frontier BMI Index excluding Gulf Cooperation Council countries in the Middle East, boast higher margins, lower leverage, and a higher yield—nearly 4%—to compensate for their volatility. Earnings growth over the past three years in frontiers, at 13%, has been better than in emerging markets, at 11%. Neither market is faring well. The MSCI Frontier Markets Index includes 27 countries, from Vietnam to Nigeria. The iShares MSCI Frontier 100 ETF (ticker: FM) is down 12% in 2015. The MSCI Emerging Market Index is made up of 23 countries from China to Peru; the iShares MSCI Emerging Markets ETF (EEM), is down about 15%. The managers like smaller companies that get dwarfed in the indexes. Asha Mehta, a frontier-market portfolio manager at Acadian Asset Management in Boston, likes the energy-intensive cement sector in Pakistan. It benefits from the lower price of crude, and regulation that supports the private sector. Valuations are attractive, at roughly nine times trailing earnings. SHE ALSO LIKES THE SAUDI MARKET, though it’s nearly twice as expensive as Pakistan. Surprisingly, it’s not as closely correlated with the oil industry, which is mostly state controlled. Mehta likes petrochemicals, which benefit from lower oil prices; as well as telecom and infrastructure, which benefit from a growing, young population with increasing spending power. The Saudi market is neither emerging nor frontier, though its liquidity is greater than all frontier markets combined. One catalyst: Mehta thinks the Saudi market could be added to the MSCI Emerging Market Index as soon as 2017, and that as EM-indexed funds pile in, Saudi market investors could enjoy big gains. A key risk is the country’s growing budget deficit as oil prices stay low. But the country has ample reserves to fund social programs and infrastructure projects. How to play them? Small, illiquid ETFs include the Global X MSCI Pakistan ETF (PAK) with assets of just $5.6 million, and the just-launched iShares MSCI Saudi Arabia Capped ETF (KSA), at about $5 million. And then there’s Vietnam. Valuations are getting pricey, at about 16 times trailing earnings, but Vietnam is expanding as the manufacturing alternative to China. Vietnam is the largest country weighting in the Frontaura Global Frontier Fund, a hedge fund managed by Nick Padgett in Chicago. Vietnam’s trade deals in Europe, and its inclusion in the Trans-Pacific Partnership, put the country in the best economic position Padgett has seen in years. Pakistan's stock exchange could see initial public offerings of power sector projects amounting to some $1 billion in 2017 and 2018, the bourse's managing director said on Monday. He also said he also expected Pakistan to regain its stock index emerging market status this year. "The projects that have had financial close and are under construction now, the tendency is that - once they get commissioned - that is the time they come onto the market to restructure their debt-equity ratio, so about $1 billion will come in." Index provider MSCI said in March it was seeking feedback from investor on reclassifying Pakistan stocks to emerging market status from its current frontier market status - a less liquid and riskier subset of stocks. The decision to move Pakistan back to the emerging category - from which it was dropped in 2008 - is due in June 2016. Naqvi said he expected Pakistan to regain its emerging market status soon, if not in June then in December, adding he expected to see money coming in from abroad in anticipation of the decision. "We saw that in the case of Qatar or the United Arab Emirates, approximately $400 million came in within 6-8 months of the announcement, and the market there is relatively narrow," he said, speaking on the sidelines of a Renaissance Capital investment conference. "Our market is much more broader, but given Pakistan's risk factor ... I will be very happy if we get about $200-250 million to come in - now this would be the initial arbitragers which would position themselves for the index flows." Currently, around 30 percent of the freefloat listed on the country's stock exchange was held by international institutional portfolio investors, said Naqvi, adding this would inevitably rise once Pakistan was reclassified. "Anywhere between 40-45 percent (of foreign ownership) would be a number I would be comfortable with, anything beyond that it becomes risky because the volatility will increase." He also expects the market capitalisation, currently at $71 billion, to rise above $100 billion in the next five years, thanks to IPOs and share valuations. "Pakistan's discount against emerging markets is huge, and I think we will be seeing a narrowing of that discount, so even though the global valuations are not going to expand, Pakistan's discount is going to narrow, and there we are going to see that in the market cap."